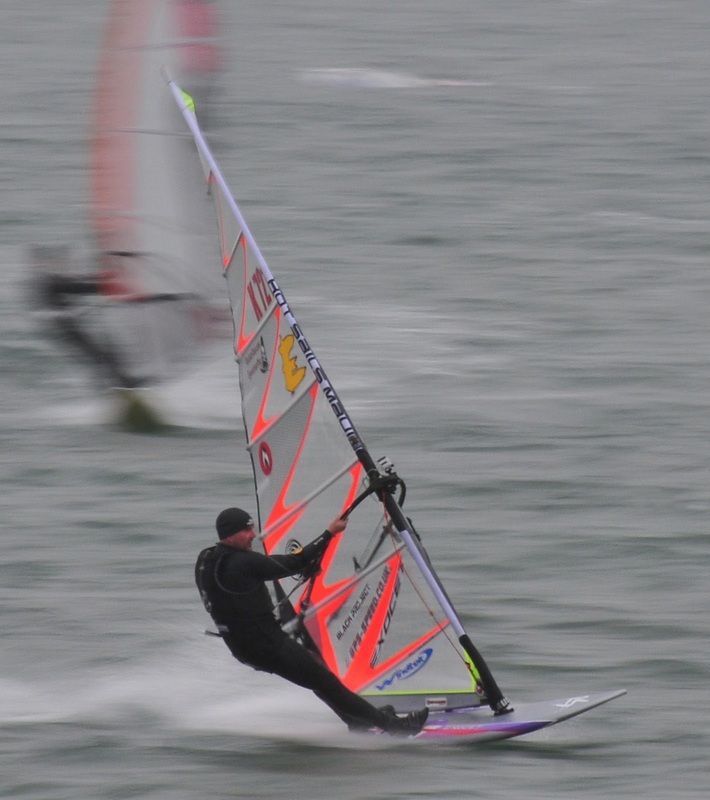 Every session I am trying out different combinations of kit, and every session I am finding perfect partnerships in what have been difficult cold conditions here at Portland Harbour. This past two weeks I have been out on the water 10 times, only one of which was me being too optimistic in very low winds trying to find the lower threshold of the Hot Sails GPS 8.8 and Exocet SL Sport 78cm. The UK for the past week has been graced with good winds, but cold showers and often hail storms. These winds I can only describe as evil as they have been gusting 50knots one minute with 15knots the next. This has provided me with a very steep learning curve since completing my quiver for this year, one day I rigged 4 sails and used 3 in a 2 hour session when the wind changed so much. Another I did such a gruelling upwind run that I coughed up blood at the end of it (this is a problem with being on Warfarin which thins blood and often can 'spike' causing a lot of bleeding......I often wake and blow my nose to see a tissue full of blood). Portland Harbour is a very choppy place in a North Westerly wind, with the wind coming off the land it is very gusty, most of this week was West veering West-North-West in the squalls. The things I have forced myself to do recently include keeping the sail and board trim locked for much longer over the chop, so much so that I have found my peak speeds and best 10 second runs out in the chop rather than close in to shore where the flatter water is. Due to the nature of our salty lake in recent sessions the wind direction means the wind near shore is light when it is strong 100m out in the chop. I will try and list my findings in an easy way to refer to. These are still preliminary findings due to sailing in changing inconsistent conditions recently I am swapping and changing kit a lot. Works very well with the 8.8m Hot Sails GPS, gybes well and will plane early but not as early as I hoped. This I am working on with different settings for downhaul and cam spacers and is probably my expectations and ability rather than the sail itself, as Jon White my team mate with Hot Sails was planing really early with his. With the 8.8 I have found little difference between the Black Project Type R 45 and 50cm fins, both work really well on the water when it is not too choppy. So far I have had a peak of 28knots with this set up which I am quite pleased with, as this was with a 500m run of 26.5knots. I am developing my technique with such big kit quite quickly and need to ready for the Slalom. When the Hot Sails GPS 8.0m is out of its bag it is best to also get the smaller board out for recreational riding, but maybe I will be better on the bigger board for slalom, only time will tell for this and if you have any advice please leave a comment. Gybing it needs real commitment to keep it planing, I am developing my technique for lay down gybes to get my speeds up with this bigger kit. Without laying the sail down I often find the foot catches a little and disturbs the trim. When I first used the 8.0m Hot Sails GPS I found the wind to be a little light. I was planing well with the SL Sport and the bigger fin but struggled with this smaller board. In hindsight the Black Project 37.5cm Type R was too small. When I tried it with a bigger fin it planed a lot better, I think the 42.5 would be optimum for me but I only have the 40cm and 45cm at present. The 8.8m fits on the board, and the board sails with it, it is not fun or enjoyable. It may be an option for the slalom races for some extra speed due to my relatively light weight (compared to slalom sailors and speedies) but not ideal. I used the 6.6 GPS with this board (or rather the pre production model) earlier in the year and although would prefer to be on a smaller board in those winds I did really enjoy the control the board offered. The Type R fins suit this board really well, I always struggled with Nautical Mile speeds on Portland Harbour due to the changes of water state in the past with different fins. Since using the Black Project when I go for an NM I dont suffer spin out over the chop like I used to. Every attempt is close to or above 25knots, where late last year I spent 2 months trying to beat 25knots. The 7.3 GPS and this board will be rapid with the wind in a good direction. I used this combination with the 34cm Black Project WeedSpeed earlier this week and found no difference between it and a normal fin. That is apart from the dropped gybe where I caught the fin in the harness lines and spent 5 minutes trying to clear the boom from the fin (lesson learnt....). Again I think this will benefit from the Type S 35cm fin. This board really comes into its own in 22-28knots with the 6.6 GPS, really controllable and really easy to gybe. It works very well with the Type S 32cm and the 6.6GPS. After doing an average 17.28knot hour with this combination I was really surprised at how few gybes I had dropped, the hour included times in the water adjusting harness lines and sorting out a boom clip that came undone 3 times (now fixed with bike innertube, this is an old and well used reliable boom). I used the 6.0 GPS with the 29cm Type S but that was the day I spat out blood so no further comment until I have tried it again. The main thing I have found is how much closer my 10second speeds and peak speeds are now. In the past I used to find they were more often than not 2 knots different, with the 5x10 average up to 4 knots slower than my peak. In confused chop on Tuesday my peak was 31.35 and my 5x10average was 30.53. For me this is a huge improvement. Last year I wanted to get my peak speeds, now I recognise the importance of the 5x10 average and also the 500m run. To conclude I have found that the 7.3 Hot Sails GPS and the 35cm Type R fin are my most used combination, currently with the bigger board due to slalom training but as I am building my confidence after 2 months with little wind my smaller board, the Exocet RS2 is getting used a lot more. Photos taken by Andy Stallman who must be one of the best Dads in the world, he takes his son Scotty windsurfing nearly every time the wind blows. Scotty who is only 10 will be one to watch in the near future I think, watching him backwind the sail and casually sail upwind was amazing.